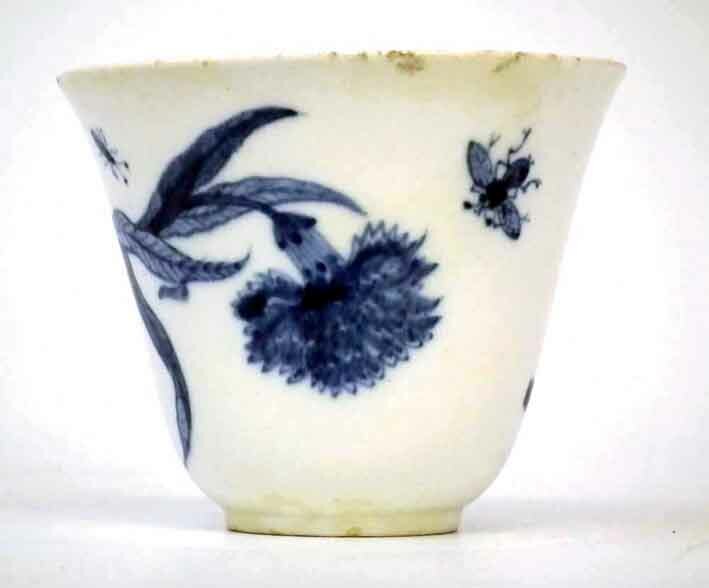 A Chelsea porcelain beaker with blue and white botanical decoration caused a sensation at Peter Wilson latest sale in Nantwich. Estimated at £100-200, it sold at £37,000. 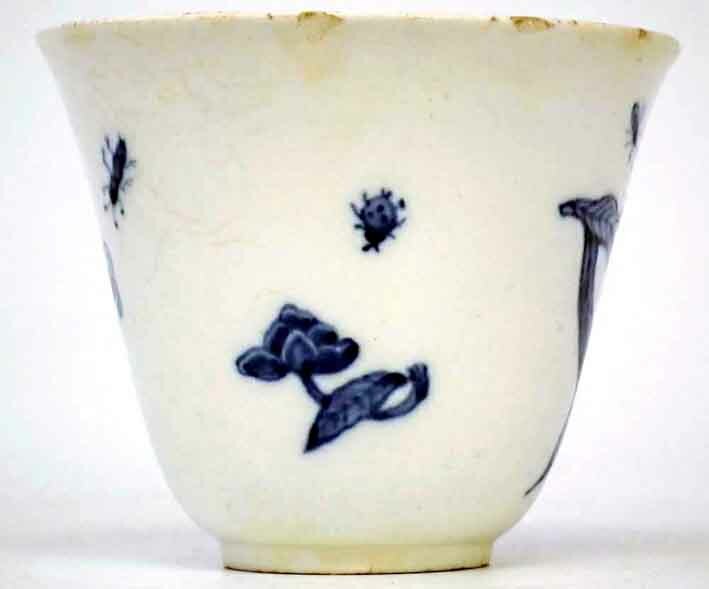 Chelsea decorated few pieces in underglaze blue; from its inception c.1743-45 the factory concentrated almost exclusively on polychrome and blanc de chine wares. Just one other beaker of this form and decoration is known - that from the Nigel Morgan collection (Australia) pictured in Flowers and Fables: A survey of Chelsea porcelain 1745-69 by Margaret Legge (1984). However, what made this chipped and stained Cheshire vessel particularly desirable was the presence to the base of a crown and trident mark. Only a handful of pieces of Chelsea soft paste, each thought to date to c.1749, carry this enigmatic mark, which may denote a yet-to-be unravelled moment in the factory's history. A breakaway enterprise or a factory offshoot has been suggested. Of the 20 or so pieces of porcelain to carry the trident (most in institutional collections), a milk jug moulded with acanthus leaves and six stalk feet sold for £12,500 at Bonhams in 2003, while the last on the market was a white tea plant beaker that formed part of the 2008 exhibition held by Kensington Church Street dealer Simon Spero. Last week Mr Spero described the appearance of a hitherto unknown beaker in Nantwich as "the kind of thing a collector who has the funds isn't likely to see again in his or her lifetime". Peter Wilson's vendor was a regional dealer who had bought the 2½in (6.5cm) high beaker as part of a tray lot at another auction house. 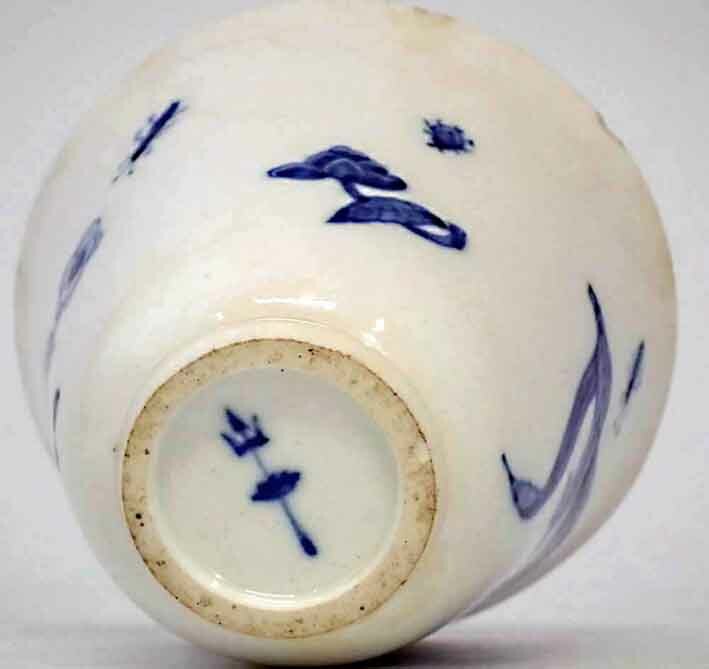 Specialist Chris Large had suggested it might be "the rarest piece of English porcelain I have ever held in my hand", but, on the suggestion of the consignor who considered it 'wrong', plumped instead for the cautious catalogue description "a soft paste porcelain beaker bearing the trident mark found on Chelsea". The condition report referred to five rim chips, staining and a glaze chip to the foot, with nine images available for inspection on the internet. It was enough to attract multiple suitors at the auction on February 18 before the final competition between a lady bidding over the phone and the successful UK private collector whose bill with fees was close to £45,000.